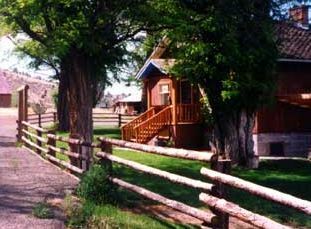 Wilson Ranches Retreat Bed and Breakfast Inn, Fossil Oregon OR. Region: North Central Oregon 2 miles west of Fossil. 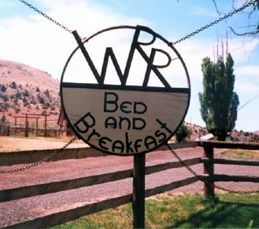 Wilson Ranches Retreat Bed and Breakfast is hidden in Butte Creek Valley two miles west of Fossil, Oregon. WRR is sited in a circa 1900 ranch house on Phil and Nancy Wilson's 9,000 acre working cattle ranch. The Wilsons are fifth generation Oregonians whose pioneer families settled in Wheeler County in the 1800's. The Retreat is within an hour's drive of the three John Day Fossil Beds National Monument units. Fossil offers public fossil diggings, museum, interpretive center, and historic courthouse. Kinzua Hills Golf Course and John Day River bass fishing, swimming and raft trips are also available. WRR is known as "The Best Rest in Wheeler County." The Bed and Breakfast has seven guestrooms, large living and dining rooms, full kitchen, guest refrigerator and microwave, and a spacious deck and lawn for lounging. Wilson Ranches offers trail riding, cattle drives, hiking, 4x4 truck ranch tours, photo-ops, and wildlife watching.